Tastes and People Changed at My Church In Modesto. I Learned To Change With Them. My path to becoming a choir director and Christian recording artist began with a move from Guatemala to Modesto, California. It was 1992, I was 9 years old, and my grandmother had died. My grandfather, who was living in the United States, moved my mother and me to Modesto. 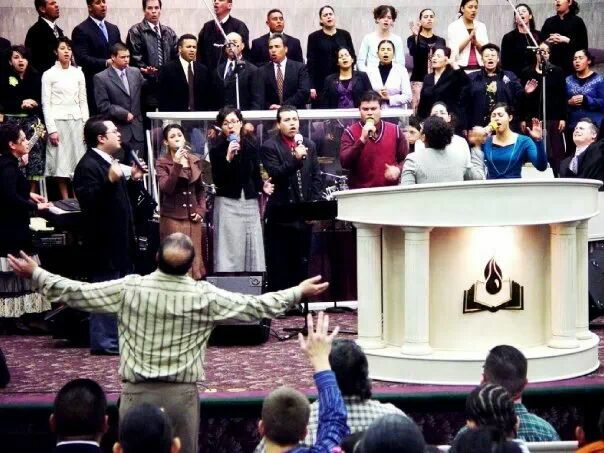 Before long, we were worshipping at Revival Center, the Spanish branch (what we call a “daughter work”) of the United Pentecostal Church in Modesto. At the time, the church had about 20 to 25 members. During those early years of the church, our music department consisted of only our pastor. He didn’t know how to play any instruments, so he would just sing English-language church hymns like “Amazing Grace” and “When the Saints Go Marching In.” Instead of musical instruments, we had our hands, and everyone clapped as we sang. A year or so later, we got an electric piano, and the daughter of our co-pastor became our first music director. This opened the door to more variety. In order to appeal to our expanding immigrant congregation, we began to sing a lot of Spanish-language songs by an artist named Marcos Witt, a Texan who grew up mostly in Mexico and started publishing Christian music in the 1980s. Witt came out with new albums almost every year, and nearly all of the new songs made it into our repertoire. We’d also sing music by Mexican Christian songwriters like Jesús Adrián Romero and Marco Barrientos, and a lot of the songs were less like traditional hymns and more like modern ballads. There were also songs with a faster tempo, and people would get up from their seats and move. I took piano lessons throughout my high school years, and each class cost $10. This was a big burden for my mom, who worked in a hotel and didn’t make much money. But I got better, and at church one day, when both our music director and piano player were out, I got to be the pianist. Playing for the singers, choosing the songs—it was a dream come true. I also joined the church choir. During those years, my voice was changing. I could be singing tenor and suddenly a squeak would come out and make me sound like a soprano. In 2001, when I graduated high school, I attended a music conference in Jackson, Mississippi and heard gospel music for the first time. I loved the fast tempos and interesting melodies. When I came back to California, I was ready to try out some gospel at our church, and I translated the words from English to Spanish. I expected everyone to love it as much as I did, but I was wrong. First, the singers had some trouble with the new style and rhythm. Then, the congregation didn’t know what to think of the music. I saw that we would not soon become a Spanish-speaking-gospel-singing church, but every now and then the music director or I would throw in a half-beat gospel song during our services. In 2003, our music director announced that she was getting married, and that meant she’d be going to a different church. I inherited her role. This was very exciting for me, but it also involved a lot of new challenges. The Christian singers we’d been following in the 1990s were still putting out albums like clockwork, but their musical styles were changing. For example, a song on a Marcos Witt album featured rapping. I wanted to find new ways to reach a new generation of church members, since we’d grown from around 30 members in the early ’90s to about 125 in the first years of the new millennium. Many church members told me they wanted to hear mariachi music. This didn’t help me much, though, since I couldn’t produce an authentic “mariachi” sound with our instruments (drums, piano, bass). But then something new hit the Spanish Christian radio waves: songs in the genres of cumbia and merengue, both of which are known throughout the Latino community. That was my answer, and I started to give some of our songs a nice cumbia and merengue beat. I also kept an ear open for any popular English-language Christian songs, which I would translate into Spanish. In 2005, I became a Christian songwriter myself. It all began when a preacher visited us from Houston, Texas. He was a singer who had recorded several albums, and one day he came up to me after a service and asked if I’d ever considered recording my own album. He offered to help me put one together if I could travel to Houston. Church members heard about this and collected money for my plane ticket. I was extremely surprised and grateful. But there was one tough condition: recording would take place in a week, and I had to write all of the songs before then. I don’t think I’ve ever been as busy as I was over the next few days. I’d play the piano for a while, just random melodies. When I played something I liked, I wrote it down. Then I’d put words into the melodies. Since our church was mainly Spanish-speaking then, and our entire repertoire was in Spanish, I automatically wrote the songs in Spanish. Sure enough, within a week, I was able to get nine songs down. Then things got even better. The preacher in Houston called me and said that a friend of his had heard the songs I’d written (I’d sent them along in advance) and liked them so much that he offered to arrange the songs himself. This person had arranged the music for Marcos Witt, the author of so many of our church songs. Soon, I was in Houston in a professional studio. It was amazing to hear the actual songs, with strings, drums, and all these other instruments. When I came home, my pastor called the pastors of churches in different cities in California so that I could visit and sing and sell my CDs. I sold 800 CDs in just a few months. Recently, I was hired to help a new church with its music department. This church in Patterson, California reminded me of my own church in the early ’90s. The congregation sang traditional hymns. They clapped their hands. They just used a piano and drums. They probably would have kicked me out if I’d started playing cumbia or merengue, not to mention some of the “soft rock” our church youth has fallen in love with. But I enjoyed playing there. It was a nice change to be able to play oldies once a week instead of the more updated sound we now play at our church. In my time as music director, I’ve learned how important it is to stay versatile. I have to keep an ear out for what’s new and constantly check to see what the congregation wants to sing. People can sometimes be really mean about this sort of thing, even in church. But the good things far outweigh the bad things. And, every now and then, I’ll play and sing a string of “oldies” from back in the days when we had no piano. Then I get to see old-timers light up and start singing along and clapping. I enjoy that, too. Luis A. Lopez-Quinonez is the choir director of Los Verdaderos Pentecostales de Modesto, which is the Spanish-speaking daughter work of Revival Center United Pentecostal Church of Modesto, California. *Photo courtesy of Luis A. Lopez-Quinonez.